The Welara Pony comes from a cross between Welsh Ponies & Arabian horses, and the resulting animal possesses refined beauty, intelligence & a good temperament. The Walkaloosa is an appaloosa horse that moves with an ambling gait, like to the Spanish Jennet. Appaloosa horses have displayed a pacing gait date back to China thousands of years ago & slowly made their way into Europe and eventually the Americas. 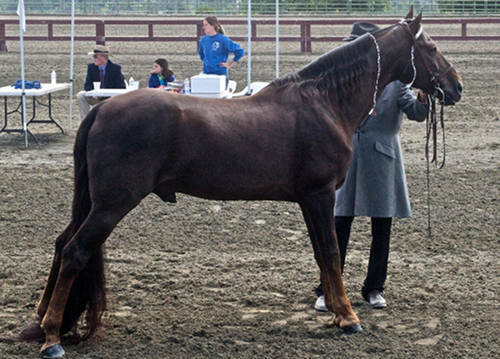 The Tennuvian horse comes from a cross between Tennessee Walking Horses and Peruvian Pasos. Although there is a strong chance these two breeds have been crossed before, the Tennuvian name was officially coined by Paula Bosner of Colorado. The Sugarbush Draft Horse has an interesting story to tell, as against all odds the colorful breed has persisted throughout the years. The Spotted Saddle Horse is of saddle type and defined & registered by their colorful coat patterns that must meet specific characteristics. Known for their distinctive gait, the Tennessee Walking horse plays an important part in the history of American gaited horses. Their bloodlines were influenced by the plantation economy and needs in the southern part of the U.S. during the early to mid 20th century. The Single-Footing Horse is a rather unique breed because they are bred and shown specifically as trail horses & possess the specific characteristics the benefit that cause.